I have to tell you about the wonderful carrots we are eating right out of our garden this winter. 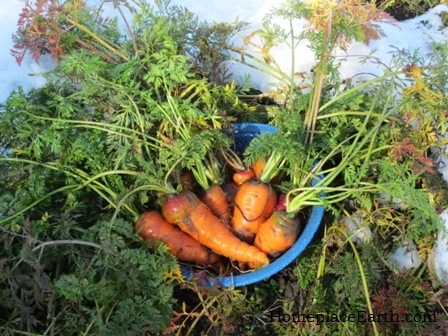 The carrots you see in the photo were pulled January 18, swished in a bucket of water to take the mud off and photographed right in the garden. We had our first snow of the year the night before and you can see that didn’t bother them. The varieties I planted are Danvers 126 (on the left in the photo) and Chantenay Red Core (on the right). The seeds came from Southern Exposure Seed Exchange. In their catalog both varieties were listed as having a blunt end, with Danvers growing to 6½’’ long and 2’’at the shoulders and Chantenay 5½’’ long and 2½’’ at the shoulders. I have done a taste test and looked at both varieties side-by-side and I have to say, unless I was really looking for differences, I wouldn’t be able to tell which was which. One was ever so slightly sweeter, but they were both so sweet, it didn’t matter. The carrots of both varieties varied in size. I cut the larger ones into carrot sticks to eat raw and put the small ones into soups and cooked dishes. A favorite snack (or quick lunch) of mine is to cut carrots into sticks and use crunchy peanut butter as a dip. Delicious! To have all these carrots available now took some planning. 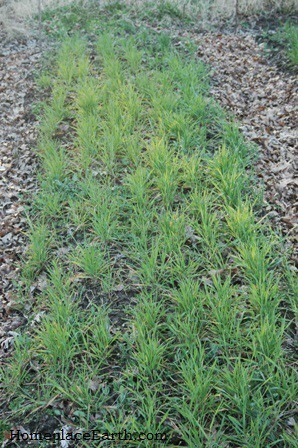 They were planted back on June 27 into a bed that I had harvested rye from, cutting it at maturity for grain and straw. The planning, however, went back further than that. The rye was planted on November 3, 2011. Knowing that I intended to plant carrots next, I made furrows close together with a hoe and planted the seed in the furrows. 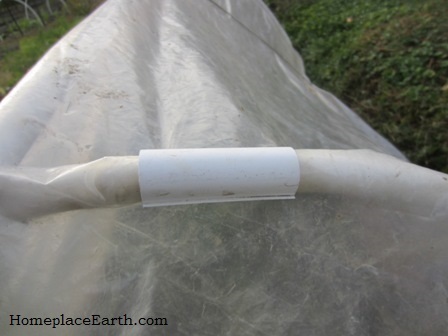 Otherwise, I would have just broadcast the seed and chopped it in with my cultivator to cover it. When rye and wheat are harvested at full maturity, the roots are already on their way out and the soil is soft. The stubble was in rows and I just hoed between those stubble rows and sowed the carrot seeds, covering lightly. The brown stubble that was left in place gradually decomposed, feeding the carrots. I had to be diligent with watering and replant in a couple areas that had not-so-good germination, but I have been rewarded well. This photo was taken on November 22—Thanksgiving. 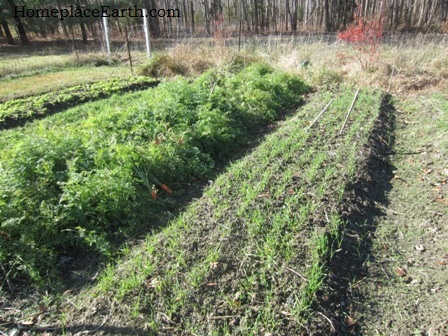 On the left is the carrot bed we are eating from now and the rye that I planted on October 23. You can see the rows in anticipation for next year’s carrots. Although these carrots were outside the part of the garden that I keep intense records on, I couldn’t resist finding out how much was really there. Of course, I wasn’t going to dig the whole bed all at once to find out. Neither was I going to weigh each carrot I harvested, something I would have done if I was keeping those intense records. 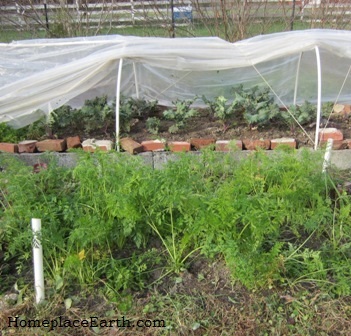 Instead, I dug carrots from a 2’ strip for each variety. The bed is 4’ wide, so I was measuring how much was in 8 ft². From that measurement I calculated how much it would work out to for a 100 ft² planting. The results were 115 lb/100 ft² for the Danvers and 145 lb/100 ft² for the Chantenay. I think these are accurate estimates and the yield could have even been a bit higher. I had randomly harvested some carrots previously, so some could have already been taken from these areas. In this trial Chantenay yielded more than Danvers, however since I wasn’t paying too much attention to details (such as randomly harvesting earlier) I wouldn’t say that one variety out yielded the other—yet. Maybe I’ll be more serious about it next year. 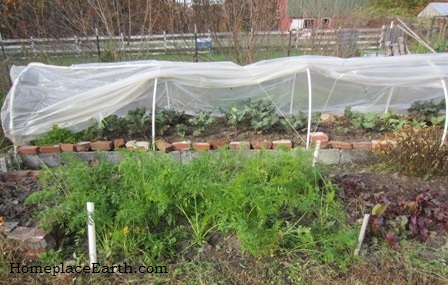 Once carrots (and other root vegetables) get hit with frost they sweeten up. Eliot Coleman writes about that in Four Season Harvest. For that reason I only grow carrots for fall and winter harvest these days. Sort of like enjoying strawberries when they are in season. Summer carrots just don’t taste as good and there are so many other things to be eating from the garden in the summer. I need to plant the carrots so that they will be mature by mid-October. Keep in mind that once the nights cool down, growth slows. After mid-October they are just being held in cold storage in the garden until we eat them. If you have been following my blog you know I have trouble with voles. One end of this bed has had some vole damage, but not the devastation you would expect. That could be because I didn’t mulch these carrots. If we were to have harsher weather than we do, I would mulch with leaves, but not until the cold weather really sets in. I want the voles to find other winter homes before I cover the carrots. At Christmas I usually give sauerkraut to some friends and family. This year I hadn’t made sauerkraut. I was celebrating the carrots that were bursting from that bed that I had tended all year, so everyone received carrots. I’m not sure they were as excited receiving the carrots as I was giving them, but oh well. Maybe I’ll get sauerkraut made for them next year—with carrots in it. 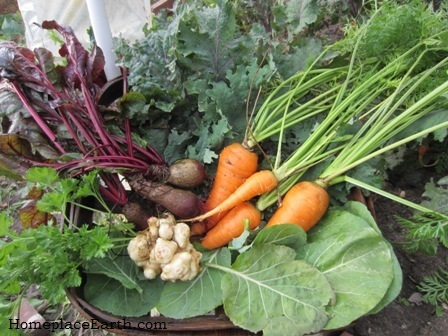 If you would like to be eating carrots like this in mid-winter, keep that in mind as you make your garden plan for this year. 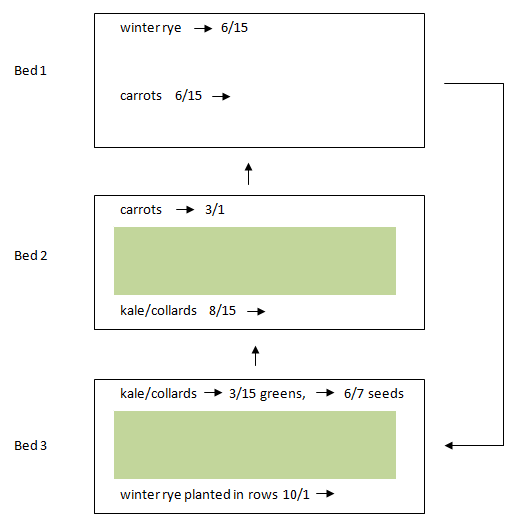 I actually make a note on my garden map to plant the rye in rows in that bed so I don’t forget. You’ve missed the window of opportunity to have rye planted in rows for this year, but maybe you can sneak some carrots in somewhere. Make sure to plant them early enough and water well. Good luck!